After a wiring problem, I finally figued out the wiring and got this old girl running. It is really well made with the cast iron motor. For paint I want to just use evaporust to clean the oarts and preserve the original paint and still havent decided on polishing the blades. That's a very nice fan Dylan, though with the amount of rust on the base, I would seriously consider a repaint. Others on this forum prefer to leave them as found. Even if you don't want to polish the blades, I would still clean up that pretty little Century badge. The wire is not original to that fan. Maybe you would want to replace that? Perhaps someone on the forum would care to date it. I'm thinking late teens or early twenties? Mid 20s for those fans. 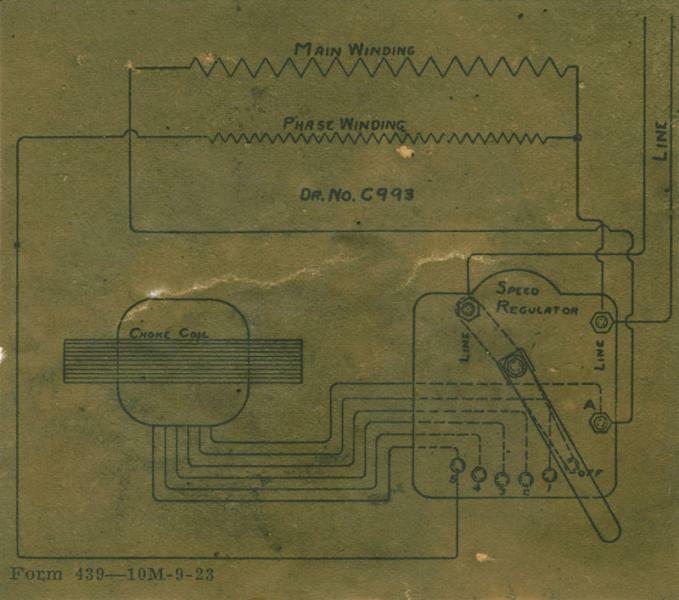 Here's a wiring diagram inside the base for a Model 154 solid cast iron motor 5-speed. Note the 9-23 date on the bottom which would have been when Century ordered a big batch of these tags. Up running. Bet she has a beautiful startup sound. Page processed in 0.1422 seconds (9% database + 91% PHP). 27 queries executed.